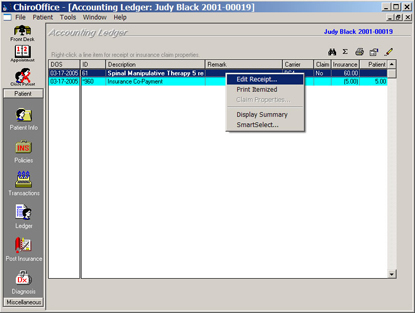 All services, payments and other accounting activity are shown in the patient's accounting ledger. You can display filtered date ranges and transaction types. This gives you the flexibility to audit an entire account with all transactions, or to generate a "services only" statement for a date range, as often requested by a patient's attorney. This window empowers you with maximum detail and editing. The perfect tool for the office manager, this is the managerial summary of all employee's projects. View all Sunday, June 21, 2009 1:23 AMbsp; Some projects have alarms associated with them. Other projects are general "to do" items with their due dates. This is a great way for multiple employees in an office to better work more cost-effective as a "team". 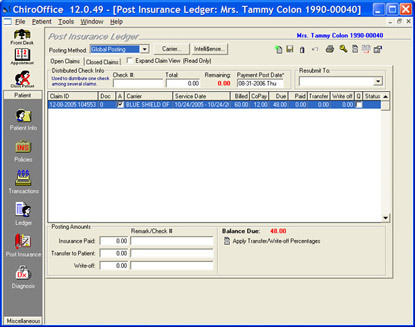 When you enter the insurance claim digest, you see all insurance claims that are open or closed for this patient. Each claim represents either a HCFA-1500 form, or an electronically billed insurance claim. To post payment to a claim, simply select it. You see the paid, refused, and write-off areas for you to apply payments. If you should resubmit a claim to a secondary insurance carrier, it is automatically selected in the resubmit to box at the bottom. If you would like to see the transaction detail on an insurance claim, right-click the claim and select Properties. You'll see the insurance claim detail window appear.